Are you changing cities for a temporary position? Vacationing abroad with family? Renovating your home? No matter what your reason is for needing a furnished rental apartment, you know that you want it to be perfect for you for the duration of your stay. Apartments that come furnished are practical for renters, therefore it’s evident that owners constantly secure rent. Room reservations are regularly in demand. When it comes to furnished housing, you ought to know that there are different sizes from studio, 1 or more bedrooms, to absolute condos or entire houses. Studio sized apartments are spaced for housing a single person or couple at maximum. Stereotypically, they’re tiny; many with an exposed bed and kitchen. One bedroom, 1+den or 2 bedroom furnished condos or houses have a lot more legroom and can comfortably contain countless guests. 1. If your reason for needing a rental has to do with work, find out if your company offers Corporate Housing accommodations to their staff. Most of the time there are special rates for fully furnished condos, or houses. 2. Surf the web, click on classified sites and type in keywords like “furnished apartments,” “short term condo rentals” and see what the search reveals. To narrow down the results you just have to be more specific, include the location you wish to stay, the size of the unit you need, etc. If you do choose to go this route, always have written proof of the terms and conditions. 3. Let the experts find the perfect furnished apartment for you! SkyViewSuites are attentive in their service and enthusiastic in helping those who need peace of mind. 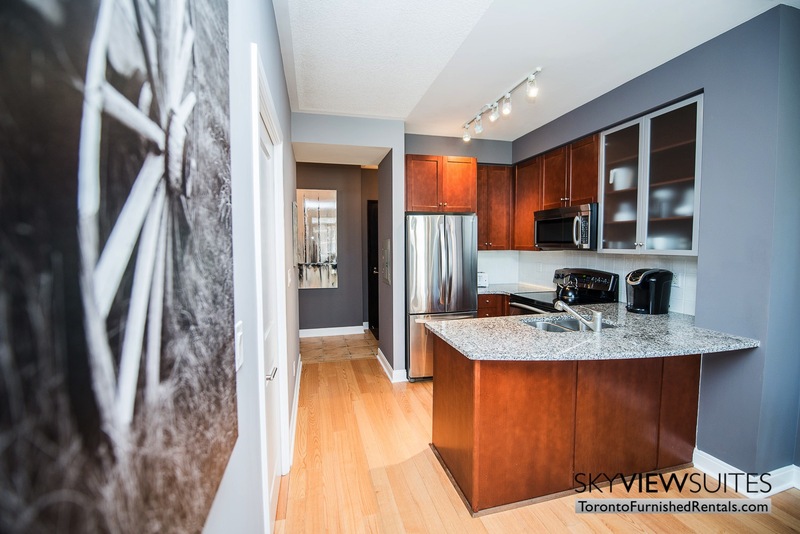 Their fully furnished condo rentals are located across the GTA and are very accommodating. If you are searching for elegant, affordable units, look here: www.torontofurnishedrentals.com. These are 3 easy steps that will help you find your perfect furnished rental. Do not forget to do your research and gather all the information you need to help you make a guided decision. Remember to get any agreements in writing and don’t be afraid to ask for clarification on anything. You will be the renter; you have the right to know exactly what it is you are paying for.